Naoya Kawakami is one of the coolest underground artists and musicians from Japan. 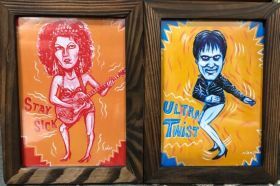 He plays in the band BOBBY’S BAR and makes amazing paintings about monsters and pop culture. We interviewed Nao and chatted a little about toys, monsters, rock n roll and other fun stuff. Enjoy it! "Lily collects records and she loves DJing anytime she has the chance. Her favorite music is soul from the 60’s. She also likes design, Mod fashion and riding her scooter around the city." Now you can listen to the PAPER DOLLS soundtrack on our spotify account. Each one of our 6 girls have made a playlist with their favorite music. 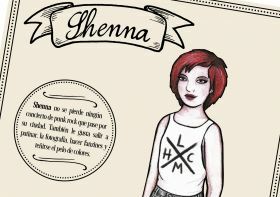 Now is time to listen to Shenna’s playlist, dedicated to Punk rock, from the classics to new discoveries. 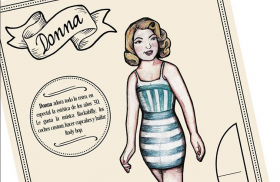 Donna is the first one in presenting us her collection of songs, full of Rockabilly, swing, doo wop and other sounds of the 50’s. 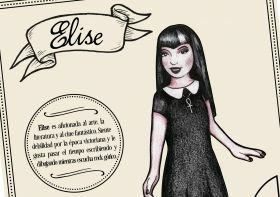 PAPER DOLLS, new activity book! Everybody knows PETER BAGGE as the creator of HATE and the master of underground comics, but he also has a few comics for all ages like Yeah!, The Megalomaniacal Spider-man, The Simpsons comics or the Monster comics that he’s making for Creepy. We were lucky enough to meet him and ask him a few questions about all that and other neat stuff. Are you a true Monster Kid? 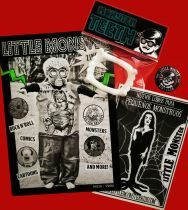 Then, you will love this special kit that includes: a copy of the LITTLE MONSTER zine, an exclusive Monster Teeth, a cut out monster card and an official LITTLE MONSTER KIDS CLUB member badge. Don’t wait any longer and join the Club! Available now at our online store. Kaz is one of the minds behind “SpongeBob SquarePants” and the creator of the classic comic strip “Underworld”. He’s also a funny guy with a lot of crazy stories to tell. And he was generous enough to share a few of them with us. Enjoy. LITTLE MONSTER ZINE: THE FANZINE FOR KIDS! 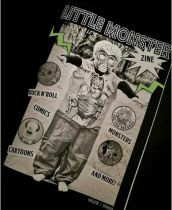 Little Monster zine is the fanzine for little monsters dedicated to the best family entertainment. In this issue you will find the comics and cartoons of Johnny Ryan and Jorge Monlongo, the monster music of Chumi Chuma and Hombre Lobo Internacional, the Punk Rock for kids of Fun Fun Records, the “Monsters” trading cards collection, KISS movies, games and a poster by Shawn Dickinson that you can color! And get the Krampus on time for Christmas! Here's the special Christmas Playlist by Little Monster for the whole family. 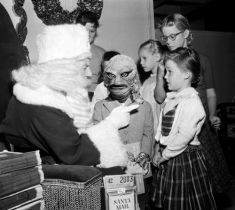 Listen to these great songs by the Ronettes, Weezer, Sesame Street, The Ramones or Royal Crown Revue while you wait for Krampus or Santa to come. Enjoy this collection of Christmas songs for kids and adults and have a monstrous Christmas! ROCK FOR KIDS: HOMBRE LOBO INTERNACIONAL, ONE WOLFMAN BAND! We were lucky enough to have HOMBRE LOBO INTERNACIONAL playing at the LITTLE MONSTER books release party. Since then, his LP “Early recordings” hasn’t stopped spinning on our record player. We could do nothing but talk with him to know how is a wolfman’s life on the road. 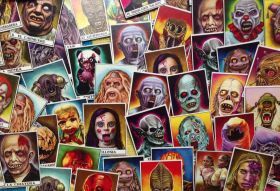 MONSTERS is an old school trading cards collection that brings back the spirit of trading cards collections from the 80s, with a vintage style and classic artwork. We talked with artist Pablo “Obelix Hell Art” about his work on these cards and other monstrous stuff. 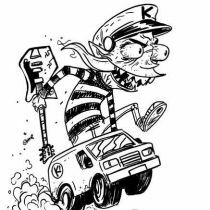 PUNK ROCK FOR KIDS: FUN FUN RECORDS! 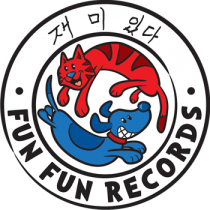 Fun Fun Records is a children’s music label where musicians from bands like The Bouncing Souls, Groovie Ghoulies, The Aggrolites or Screeching Weasel are putting out great music for kids. The label is run by Mike Park, a punk rock veteran, owner of Asian Man Records, who has played in many bands along the years and now has his own project of music for kids. We asked him a few questions about this and other fun fun stuff. ROCK FOR KIDS: SUMMER SONGS! New spotify playlist of rock for kids and adults! We made a summer playlist to listen with an ice cream in one hand and the float in the other. 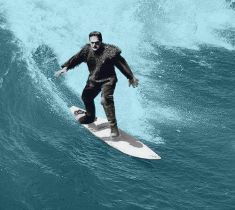 Surf, beaches, sharks, sun and a lot of rock ‘n roll for this hot and fun season. Enjoy it! Jorge Monlongo is one of the best cartoonists in Spain. He has been nominated for an Eisner and “Autor Revelación” at the Barcelona Comic Con 2016. He combines personal projects like “No me pegues que llevo gafas” with comics for kids like Mr. Peabody & Sherman, Hello Kitty, Cow and Chicken and Mameshibas. He also illustrates children’s books and paints little girls with swords, so we had a lot to talk about.